3-Step Form to Notify us of Your Vitamix Purchase! Did you recently buy a Vitamix through our site? We want to make sure you’re well taken care of! And, we want to send you a copy of our eCookbook. No charge, just a special thank you for supporting our site. Not sure? Look for 06-NOYOKE to appear near checkout. Still not sure? Clear your shopping cart and then use this link to begin again. Notify us of Your Vitamix Purchase here! Yes, I ordered my Vitamix using a referral link from Life is NOYOKE to vitamix.com. 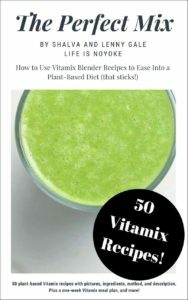 This ebook has 50 of our best, most tasty Vitamix blender recipes. From smoothies to soups to nut butters to ice cream, these are our most beloved, creative, and popular creations. Plus, the story of our journey to eating more of a whole food, plant-based diet.